1. Heat oven to temp given on package. 2. In a small bowl, melt the butter and add the olive oil and chopped garlic. 3. Mix together the herbs, flour, 1 tsp. of truffle salt and the black pepper. 4. Open the bag of fries and pour them into a large bowl. 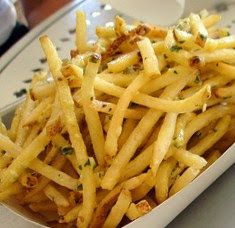 Drizzle the melted garlic butter over the frozen fries. Sprinkle the herb powder over the fries. Stir until the fries are well coated. 5. Transfer the fries into a single layer on a baking sheet. Bake for 18-20 minutes, or until the fries are golden brown. Remove from the oven and toss immediately with remaining truffle salt to taste. Great, thank you! Simple as that :) I've actually never heard of truffle salt. At a bar in Salem, Mass. I had tator tots with truffle oil, fresh grated parmesan-arregiano cheese and some spices. Heaven! !